Home → California Bar Exam Review → The Bar Review Podcast – Subscribe! 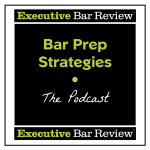 Bar Review strategies in short, easily digestible podcast bites. Subscribe to hear new episodes as soon as they are released. Click the black banner to follow the link to the first two bar review podcasts with tips for the Performance test and bar subject matter memorization techniques. If you prefer Google play, click the link in the header. Brought to you by the bar review experts at Executive Bar Review. Contact us for a free bar review consultation.